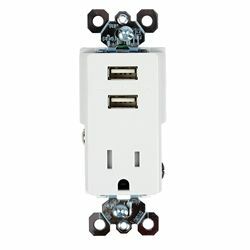 Designed to replace conventional duplex receptacles, this tamper-resistant receptacle includes a USB charger that provides up to 2.1 amps through two ports to charge a tablet or two smartphones simultaneously. It installs easily and accepts standard wall plates, while the patented tamper-resistant shutter system prevents objects like keys or paper clips from being inserted into the AC socket. Faceplate not included.